Snow Run™ | San Jose | It's The Most Wonderful Run Of The Year! Your Snow Run Pass includes a Snow Run Participant shirt, a wristband, sunglasses, bib, a Snow Run Medal, and all the snow you can get your hands on - plus music, dancing, and a lot of Holiday Cheer! Snow Run is on its way! Get your crew together and let them know - tickets are selling FAST! *Children ages 6 and younger are welcome to come, run the event, and observe for FREE if accompanied by an adult. We do not provide race day swag for observers. Snow Run™ check in and music opens at 7:00 am with check in times available until 8:50 AM. Arrive on time and get your gear & hang out! You can show off your outfits and enjoy the music, dancing, food and Holiday atmosphere with us. Lots of interactive fun for ALL! While the race doesn’t start till 9:00 AM, we encourage participants to gather near the stage & have a blast, take photos, and participate in the festivities before the race! At around 8:00 AM we will start prepping the audience for an experience like none other on earth…The Snow Run. We will invite participants to our start chute around 8:30 AM. From this point the music will get louder and the excitement builds. Don’t miss the chance to sing (Christmas Carols), dance and let loose with a few thousand of your friends!!! During this time it is crucial that all participants are making their way to the start chute, and are ready to run, walk, or jog. The MC will go over the rules, charity highlight and other brief announcements. At 9:00 AM, the MC will lead the crowd in a countdown and the first wave of people will be off like Santa’s Sleigh. GET READY FOR THIS WINTER WONDER – with amazing music, dancing, snow throwing – and more snow fun in the sun than you’ve ever seen! The Snow Run will go on until every participant has finished the race, and enjoyed The Winter Wonder Festival, which is usually until 11:00 am. You will have made memories to last a lifetime! 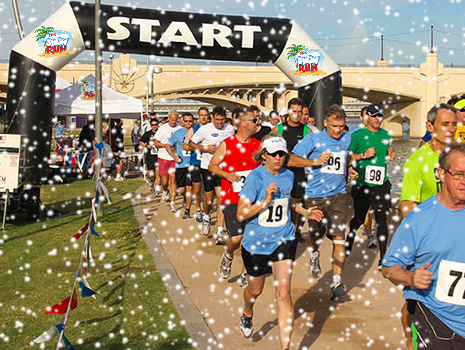 Snow Run™ loves hosting The Most Wonderful Run of the Year. We are thrilled to be able to support Non-Profits to raise awareness to the important work they do. You can learn more about all we do for Charities here. We will be announcing our charity partner for LA shortly. The Snow Run™ also known as The Most Wonderful Run of the Year is an interactive experience that includes music, fitness, food, holiday cheer - and ends with a massive winter wonder festival participants will never forget! We promote fun, fitness, and social engagement - and create outreach, information and support to important global issues. Every city we go to, we team up with local charities and bring awareness to their cause. © 2015 The Flying Tomato Festival™ - All rights reserved. Get exclusive access to early ticket sales, special pricing, and important info! The only way to get VIP tix is to join our list NOW! There are a limited number of VIP Discounts available (less than 1,000) so VIP Tix Sell Out Fast! PLUS - a handful of our first 1,000 VIPs to give a special ambassador pack of gear.